Remember the lendink lynch mob last year, when a bunch of ill-informed authors panicked over a situation they didn't understand (and assumed was piracy)? One thing I learned from that event was that sometimes people don't always know what they are getting themselves into. I was reminded of this earlier today when I read a query from a self-published author whose ebooks had turned up in places that they should not have. After I looked into the issue I decided that it might be useful to post the question and the explanation publicly (with personal info removed, of course) so other authors can find it should they encounter a similar problem. I was selling my eBook at Bookrix then suddenly I found out that buycheapr.com was selling it at Kobo. How did that happen? There's actually 2 questions here, and I will cover them separately. First, it looks like this author might not know that BookRix is not just an ebookstore. 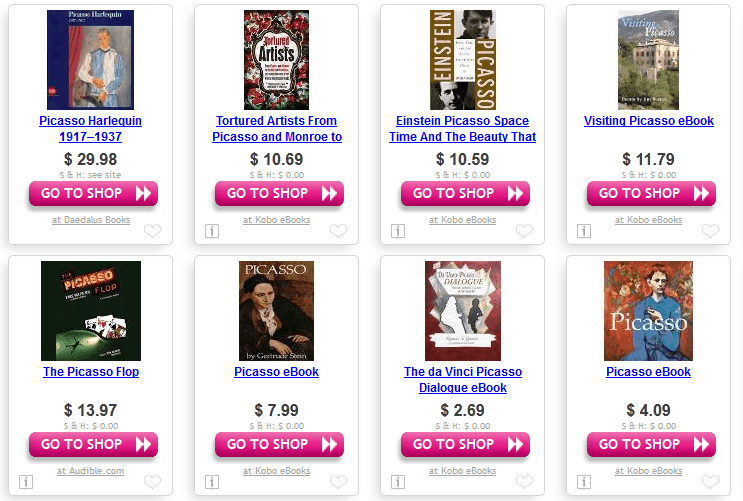 Like Smashwords, Draft2Digital, BookBaby, and others, BookRix is also an ebook distributor. BookRix is one of many services that exist to help get your ebook into the major ebookstores, and so far as I can tell Bookrix was actually the one distributing the ebook. I also found this ebook in the Kindle Store. As you can see from the screen shot at right, BookRix is listed as the publisher of this particular Kindle edition. (There's also a second Kindle edition which i suspect was uploaded by the author.) I checked for this title in the Nook Store and at Kobo. Both sites indicated that BookRix was the publisher, confirming that BookRix was just doing their job. Over the last four years, here at Smashwords we’ve faced probably hundreds if not thousands of mini-panics, many of which might have developed into raving angry mobs as developed around this one had we not taken steps to diffuse them. For example, dozens of times we’ve had authors claim illegal copies of their books were being distributed by our retail partners, simply because the author didn’t realize we were a distributor (!!). 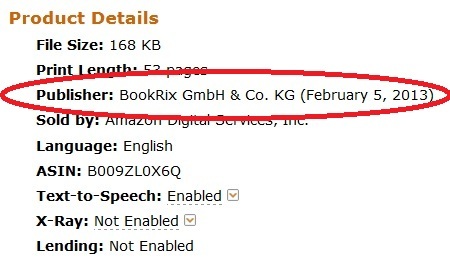 I don't know if the author intended for BookRix to distribute the ebook, but that is what appears to be happening in this case. And if this wasn't what the author wanted then they will need to contact BookRix and find out how to stop the ebook from being distributed. The second question in this query involved a site that appeared to be selling this author's ebook at the Kobo Store. I have looked into this and I cannot see any sign that BuyCheapr is actually selling the ebook, nor are they in any way pirating it. What is really going on here is that BuyCheapr is only linking to the Kobo website. BuyCheapr did not post the ebook; BookRix did. All that BuyCheapr is doing is acting as a marketing affiliate, and they want to earn a commission on the sale. This is truly nothing to be concerned about; this kind of online promotion is quite normal today.